View More In Gun Holsters - Page 4. This Pro-Tech nylon belt or clip gun holster, "The Intimidator", for Glock 20 has many features. The gun holster is ambidextrous, giving it the capability to draw your weapon from your right or left hip. Making this gun holster ambidextrous is the belt loop on both sides and the metal clip that can be moved from side to side. 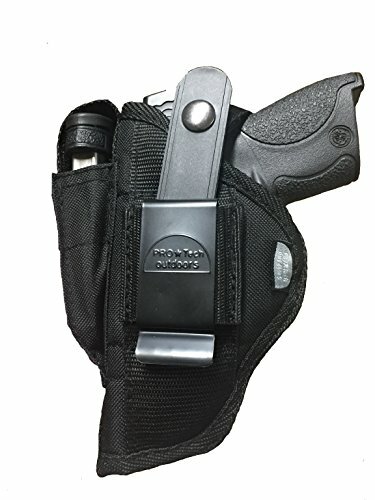 This makes the Pro-Tech Intimidator belt and clip holster a top contender in the side holster industry. The Intimidator gun holster has a safety strap. It is held in with velcro, making it interchangeable to either side for right or left hand draw. The holsters spring action tension release sets it apart from any other gun holster in the industry. Once the safety strap is positioned tightly at your desired location, you can give a swift downward motion with your thumb between the snaps to release the gun. Making this gun holster an easy to use, one handed, quick draw holster. The Intimidator belt or clip holster by Pro-Tech Outdoors is very well constructed. The outside of the gun holster is cordura ballistic nylon and inside of the holster is soft nylon. Not visible to the eye, is the thin soft foam padding and our special vinyl vapor barrier wall to help keep moisture off your Glock 20 because we know how important it is to you to keep your weapons clean. On fashion, Pro-Tech gun holsters did not fall short when it came to looks. It is stitched with strong bonded nylon and is double stitched at all pressure points for all the roughness you may encounter. Take a close look at how all the edges on the holster are turned under to prevent fraying. All the Velcro is hidden by webbing to prevent foreign debris from collecting on it. So rest assured that the Intimidator belt and clip gun holster not only performs great, but looks great also! One last thing we would like you to remember is there are a lot of holsters on the market so you have a lot to choose from so please remember a product is only as good as the ones that make it and I must say Pro-Tech Outdoors is leading the industry on quality and customer service. Their slogan says it all, "Quality above sales with customer satisfaction guaranteed". So buy with confidence knowing you will be taken care of with our 30 day money back guarantee! !